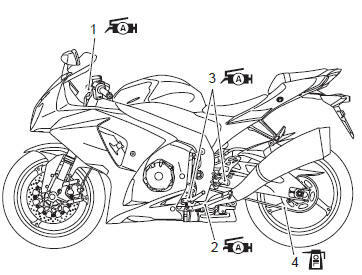 Proper lubrication is important for smooth operation and long life of each working part of the motorcycle. 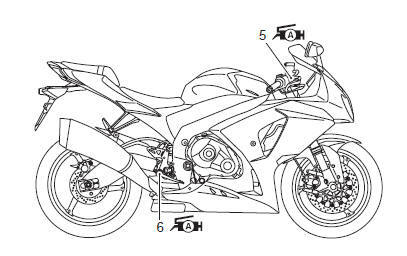 Major lubrication points are indicated as follows. before lubricating each part, clean off any rusty spots and wipe off any grease, oil, dirt or grime. Lubricate exposed parts which are subject to rust, with a rust preventative spray whenever the motorcycle has been operated under wet or rainy conditions. Brake pedal pivot and footrest pivot Apply grease.